Published in the Dover Express, 6 March, 1981. The Society consisted of eight brethren and eight sisters. A patient, on admission, had to pay according to his or her means, a certain sum into the treasury, half a mark to the warden, fourpence to each brother and sister, and a fee to the lodge porter; and before receiving the garb of an inmate, the patient had to take an oath of obedience, soberness, and chastity, promising to pray for the Sovereign, the Prior of St Martin, and the burgesses of the town of Dover, both on land and on water. Minute particulars are given in the code of rules of the eating and drinking of the inmates, especially on festive occasions. Their usual allowance seems to have been porridge, and portions of pork, barley and beer; but at Christmas, Easter, the Festival of the dedication of their church, or their own birthdays, they had special fare: while on St Bartholomew’s Day they had pancakes. The patients were taught to be modest and devout; for instance, the men were not to play pranks, or tap at the door of the women’s dormitory, and the women were not to make assignations; and, in addition to their common prayers, each of the patients, after their first sleep, were to sit up in their beds and say a prayer. According to their ability, they had to help to cultivate the land, and they shared the profits of the dairy, poultry and sucking pigs; but the money obtained for weaned pigs went to the common fund. There were many other curious details as to the regulation of their lives and conduct. The warden, brethren and sisters had a common seal, and the terrier of the land and houses which they held in Dover and East Kent is a lengthy document, which, at -the Dissolution, showed that the community possessed 159 acres of land, 24 houses and two mills, as well as small annuities of £19 Is. 4d., which, in our present money, would be well over £100, in addition to their farm produce and rents of lands. After the suppression of this Hospital, in 1535, no further use was made of it; the leprosy, for the cure of which the establishment existed, having, it is presumed, abated. It appears, by a patent of Edward VI., dated 1542, that Henry VIII, in 1539, gave this Hospital, with its church, buildings, and lands, to John Bowie, Mayor of Dover, during his life. That worthy made the most of his opportunity, for he not only destroyed the buildings most effectually, but he is said to have rifled the graves and plundered the dead. Only five years of life was left to John Bowie to carry on his destructive work, and, at his death, which occurred in 1542, these lands reverted to the Crown. The estate was then given to Sir Henry Palmer and his heirs for ever, and the lands, which appear to have extended from Cherry Tree Lane down to Paul’s Place, after passing through several hands were, in the year 1811, purchased for £5,750 by Mr William Kingsford, of Buckland. One of the privileges of this Hospital was to hold an annual fair for the benefit of its funds, and, although the establishment ceased to exist more than four centuries ago, the fair was kept up in "Bartelemy Fields“ (where Bartholomew Street now Is), until 1870. There were few, if any, houses in London Road, Charlton, until Mr William Kingsford purchased the Bartholomew land in 1810. Before that time, the Black Horse Inn stood at the comer, where the Eagle Hotel now is, and the Black Horse tea gardens occupied the whole of the land along the roadside, from the corner as far up as the boundary of what was St Bartholomew's Church. This was a popular resort, especially on the occasion of public executions, which regularly took place at that corner as late as 1823. On the 4th September, 1839, Mr T. A. Terson sold the Black Horse Inn by auction, and a frontage of 204 feet beyond it up the London Road, running back to a lane, now represented by De Burgh Street. Soon after that, the Eagle Tavern was built, and the Eagle tea gardens, on a better scale, succeeded those of the Black Horse. The end of London Road, opposite the Eagle, was for centuries called "Paul’s Corner." In September, 1647, two acres of pasture land “neere Paul’s corner," was purchased by the Dover Almshouse Trust. When the Turnpike Act came into force, the site, at the corner of Bridge Street, was let to the Turnpike Trust for the erection of a toll-house, and for use as a stoneyard. In July, 1340, the land adjoining the toll-house, in the London Road, was sold on a 62-year lease, and the adjoining frontages as far up as the Almshouse lands ran, were let on a building lease about the same time, the whole of the leases having terminated in 1902. The Eagle tea gardens were abandoned in 1863, when the Freehold Land Company purchased the whole of the frontage between the Eagle Tavern and St Bartholomew Church boundary, as a building estate. The Eagle was then re-built, and Templar Street and De Burgh Street were soon after laid out, the greater part of these streets being built upon in 1866, except that the London Road corner of Templar Street was left vacant for about 14 years, as a site for a new church. At Rose Cottage, in De Burgh Street, there died, on the 26th of August, 1877, Elizabeth Goring, aged 104 years, who retained full use of her faculties and good health until a few days before her death. The removal of the toll-gate and house, in 1855, left an important building plot vacant, and, soon afterwards, the Falcon Hotel and the draper’s establishment adjoining were built on this site at the comer of Bridge Street. Very poor house property had been erected on the margin of the Almshouse land, owing to the shortness of the lease, but there were, in London Road, Charlton, many good residences, including Charlton House, Charlton Terrace, Wellington Terrace, Charlton Place, Charlton Rectory, find eight other houses, built between the years 1810 and 1845. Allotments in and on both sides of the valley dominate this view of the Tower Hamlets area as it appeared when photographed from the air 50 years ago. The scene remained much the same until the 1950s when a new Astor Secondary School was built and playing fields gradually extended over the allotment land on the right in subsequent years. Snaking down the centre of the valley is Astor Avenue, running into Tower Street and Tower Hamlets Road near the top of the picture. Northbourne Avenue, on the left, is linked to Goschen Road, the next turning on the right, by Devonshire Road. 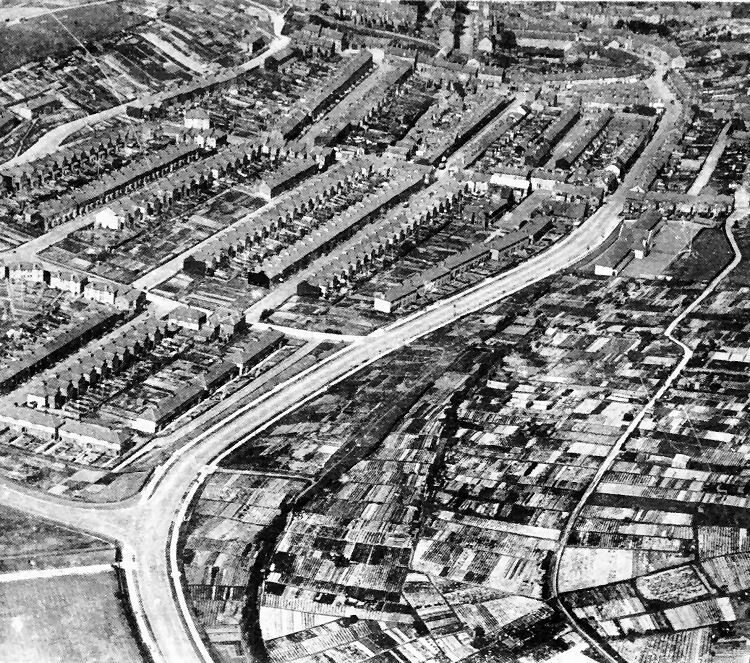 Running parallel with Astor Avenue, in the centre of the picture, are Wyndham Road, Lowther Road, Douglas Road and Noah's Ark Road.